‘Material histories’ is a small exhibition now on display in the Department. It presents graphic communication artefacts with a story to tell. The stories – the material histories – describe the artefacts in particular: what they are about, where they came from, their material qualities, their circumstances of production, how they were acquired, and crucially how they link to other artefacts, narratives and representations. 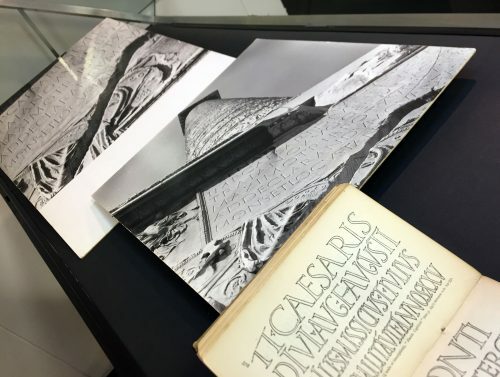 In the first in a series of posts about artefacts in the exhibition, James Mosley tells the story of Emil Hübner’s Exempla scripturae epigraphicae Latinae. Emil Hübner’s collection of Latin inscriptions, Exempla scripturae epigraphicae Latinae, is a big book. It is not easy for the ordinary reader to approach. All the text – and there is a lot of it – is in Latin. But every inscription that is listed is shown in a line illustration. Many of the original inscriptions are routine jobs, while others delightfully capture calligraphic qualities. The inscriptions, as presented in the book, are well drawn, often (according to the captions) from photographs of the originals. They are printed from ‘zincographs’, which are relief etchings made directly from the drawings. Zincography was a relatively new process at the time, whose early history needs recording. 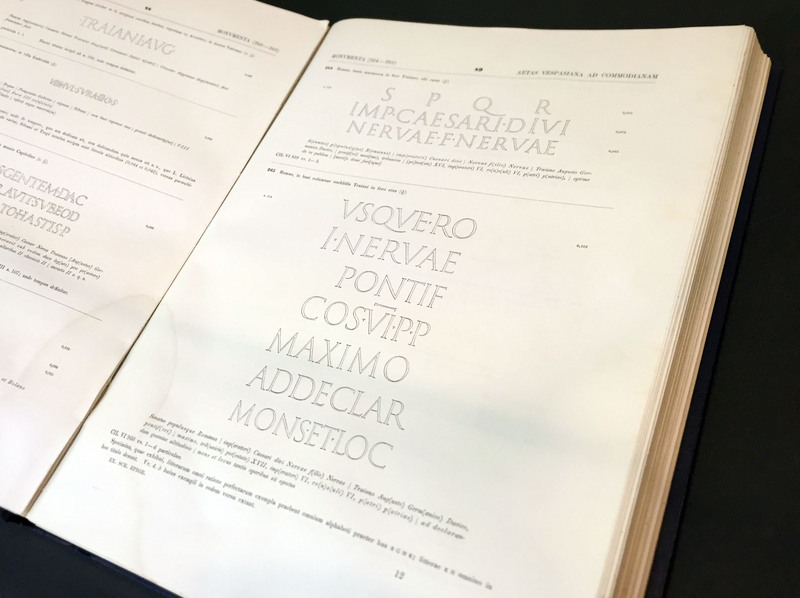 Emil Hübner, Exempla scripturae epigraphicae Latinae, opened to item 265, a sample of letters from the inscription at the base of Trajan’s column, Rome. Edward Johnston was rightly impressed with what he called these ‘fine outline drawings’, and he included samples of them in his little handbook, Writing & illuminating, & lettering (1906). In her book, Lettering on buildings (1960), Nicolete Gray complained that the scale of the originals was difficult to judge, which is true. But over a thousand inscriptions are shown and the size of each line is given. So Hübner’s book is on many people’s list of things to look at. In 1979, I received a prospectus from a publisher in Berlin offering a reprint, which I ordered for the St Bride Library. What I got was a surprise: a copy of the original book, printed in 1885, and not bound, but sewn and ready to use. I imagine that before the reprint was put in hand someone must have come across copies of the original book that had somehow survived in a warehouse, perhaps in Berlin, for nearly a century. I tipped off the ‘Typography Department’ at Reading, which ordered its own copy of the 1885 printing. This is the copy displayed here. At Reading, Hübner’s book served a serious purpose. Study tours of Rome and Florence to see inscriptions on the spot and in context had become a distinctive part of the teaching undertaken by the newly created department. My own contribution was to offer images of some of the originals that I had made during my own research trips, and which I used in my teaching. Two of these are on display. Edward Johnston, Writing & illuminating, & lettering, showing reproductions from Hübner; photographs of the inscription at the base of Trajan’s column, made by James Mosley in 1963. ‘Material histories’ continues until 11 November.